The little boat was very old. It leaked badly and was no longer reparable. It lay where it had been abandoned, on a desolate stretch of beach amongst a litter of dried seaweed, rubbish, clods of tar and drift wood. The seagulls that sometimes came to peck at the dry sea-moss on its hull, or to perch on its sides, were no company at all for they never showed any respect. No one knew to whom the little boat had once belonged, or from where it had come. There had been many different owners, and each one had cared for the little boat, repainting it and giving it a new name. In those days it had a mast, two beige sails and a rudder. It had travelled quite far, and had weathered quite a few storms. Now the little boat leaned slightly on one side, and seemed to reflect on the past. It had more than enough time for this. It would sigh and groan in the wind, or when strong tides sometimes sent little comforting ripples. The last of the remaining green paint was bleached almost colourless by the sun. Flakes trembled before they were torn off by the wind. The oaken boards were split and bone dry. The remaining iron cord holds, stays and nails were corroded with rust. One more summer when the families return, would most likely be the last for the little boat. If the children didn't do more damage to it, someone would certainly try to break it up to use the wood to make a beach fire. The old boat shuddered in the breeze. Such an end would be terrible. Naturally it yearned for the open sea again. Oblivious as one often is of one's age and condition, it still harboured aspirations of proudly riding the white-capped waves once more. Its keel was sunk deep down in the sand, and it was still moored with an old hemp rope. It seemed that the little boat couldn't possibly be spared from a most ignoble fate. Late in the following spring there was a fearful storm. It was so violent that even the seagulls were mute with apprehension. The sea was given free rein. It reclaimed the beaches and washed about the little boat. The waves seemed delighted to be able to lift it out of its old bed of sand. The old rope gave easily, with a puff of brown dust, whipped away in the wind, and the little boat was soon floating free, far out to sea. Never had it faced such a storm, and never had it felt in its old heart more worthy of doing so. When finally fulfilled and exhausted, the little boat could no longer stay afloat, it creaked then gave a last grateful sigh as it sank beneath the waves. They bowed respectfully as it passed. 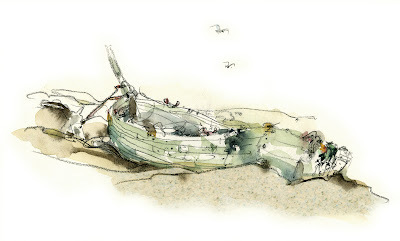 Silently the little boat slowly turned, gliding gently down until it nestled upon the soft green seabed chosen for it. And there it lay amongst the noble remains of fine galleons that had once graced the oceans.